Joel Plagenz is Conference Chair and Lawrence Bussey is Co-Chair. This entry was posted in Events, Fall Weekend on December 11, 2018 by cbd232. Vintage photos from yesteryear help us to understand the people and places that make Star Island so meaningful. Journey with us over the past hundred years through a treasure trove of authentic photos to better understand those images that capture magical moments of Star Island’s past. We will hear from the authors of the Images of America books “ Star Island” and the “Isles of Shoals” who will help us to relive the history of the places around us. Come and try a stereopticon view of the Shoals. 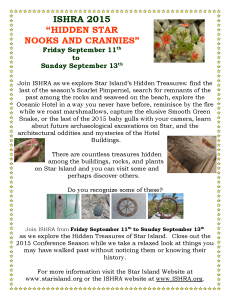 Create keepsake photos as we hear from experts on ways to create our own cherished memories with tintypes, Join renowned Star Island photography experts who will share their tips about their favorite spots on the island and help us all to see our beloved island in a whole new way. Fishing drew the earliest settlers to the Isles of Shoals—indeed, the very name of the islands may come from that era’s large schools of “shoals” of fish. Join us in tracing the history of fishing in the Shoals and New England from the 1600s to the challenges of today. This entry was posted in Fall Weekend, June Conference, News on January 30, 2018 by cbd232. 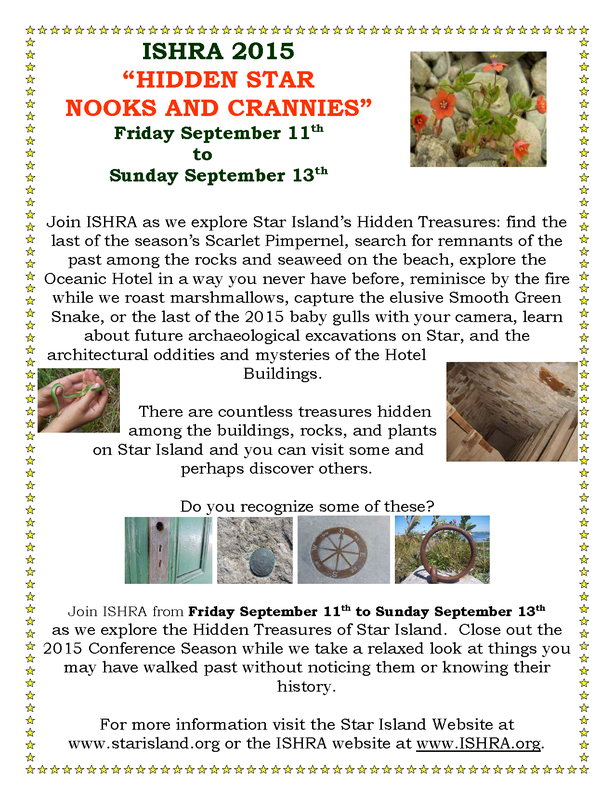 Some new discounts are in the works for this year’s ISHRA Summer and Fall Conferences! If you haven’t been to a conference in 3 years, you may get 30% off your room and board, and if you’re a returning Shoaler you can get credits for bringing new Shoalers. Please contact the Conference Chairs below for further info. This entry was posted in Events, Fall Weekend, June Conference, News on May 23, 2017 by cbd232. This entry was posted in Events, Fall Weekend on April 13, 2015 by cbd232. 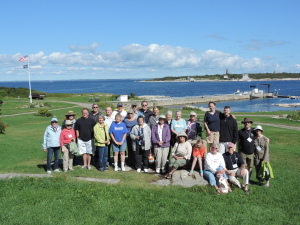 It was smooth sailing from Portsmouth to Star Island for 25 conferees, including many first-timers, who attended ISHRA’s September conference, “The Undersea History of the Isles of Shoals.” But then, tales of harrowing shipwrecks echoed through Elliott Hall in the Oceanic Hotel. Conference chair Laurence Bussey got things underway Friday night with an overview lecture and videos. The next morning, Stephen Erickson, co-author of Boon Island: A True Story of Mutiny, Shipwreck and Cannibalism, told of the 1710 wreck of the Nottingham Galley on Boon Island. A violent thunderstorm struck the Shoals just after lunch, and many rushed to the porch with their cameras to witness the excitement. Later, all were relieved to hear that Erickson’s boat had made it back to Rye safely, despite having been caught in the storm. Saturday afternoon, Professor Warren Riess told of his suspenseful search for the Angel Gabriel, a merchant ship that sank off Pemaquid Point in Maine in 1635. Later, he showed photographs of recovering nine cannons from the Nottingham Galley wreck. After lobster dinner, ISHRA’s group joined the Writers in the Round conference for a candlelit chapel service, followed by an ice cream social at the snack bar. On Sunday, Ray Demers and his son John showed photographs and artifacts from their discovery of the 1744 Royal Navy ship Asterea in the Piscataqua River, and ISHRA President Nathan Hamilton told of archaeological investigations at the Isles of Shoals. This entry was posted in Fall Weekend, News on October 14, 2014 by cbd232.